Dance this month hits the pavement running, and if you hope to keep up, you'd better get your fast shoes on. San Francisco Ballet is already in the thick of its 75th anniversary year. Late in January, it launched its glittering diamond celebrations with champagne flowing, and this week, the company began work in earnest as it floated its first two of five mixed rep programs. The month culminates for the 78-member company in a reprise of "Giselle," the sine qua non of Romantic-era ballets and one of S.F. Ballet's great beauties. And that's just the beginning of a show-stopping season. Helgi Tomasson crafts a year that starts out reflecting the foundations of American-made ballet, ballets such as that Americana gem "Filling Station" by the late Lew Christensen and the dances of Jerome Robbins. The Icelandic native then brings us back to daring stuff such as Wayne McGregor's eerie sci-fi "Eden/Eden," a ballet, set to music by Steve Reich, which has the chutzpah to examine genetic cloning and philosophical notions of being in one gulp. Few dances have caused such an unearthly buzz since Twyla Tharp dropped her "Deuce Coupe" bomb in 1973. Festival. This high-powered finale includes an all-new John Adams/Mark Morris collaboration and a piece by local dancemaker Margaret Jenkins, whose lush cerebralism fits Tomasson's aesthetic to a T. If it hasn't been obvious to balletgoers before, it should become clear this season that S.F. Ballet's director is hard at work keeping classical dance relevant for the already turbulent century. 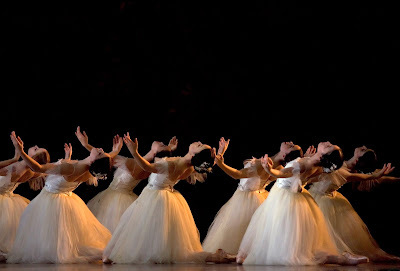 Details: S. F. Ballet Program 1, Jan. 29-Feb. 9; Program 2, Jan. 31-Feb. 10; "Giselle," Feb. 16-23. War Memorial Opera House, 301 Van Ness. $15-$250, 415-865-2000, http://www.sfballet.org. IN MEMORIAM: The great folklorist Igor Moiseyev, who trained in ballet at the Bolshoi before going on to make Russian folk dance famous, died in November at the staggering age of 101. 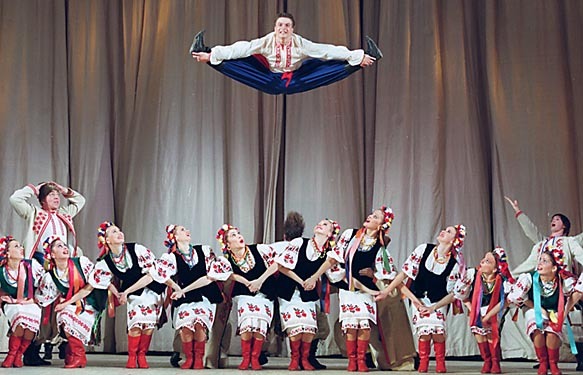 Over the years, his Moiseyev Dance Company may have done more to create bridges between the former Soviet Union and the United States than a dozen detente talks between national leaders. This month, the 68-year-old company kicks up the dust again at Cal Performances in a rousing program of exuberant dances presented with the company's renowned theatrical zeal. On their heels and from neighboring Georgia come the glorious Nina Ananiashvili and the State Ballet of Georgia, which alternates "Giselle" with a mixed-rep program. Not to be missed is a premiere by San Francisco Ballet choreographer-in-residence Yuri Possokhov. Details: Moiseyev Dance Company, 8 p.m. Feb. 8, 2 and 8 p.m. Feb. 9, 3 p.m. Feb. 10, $24-$48; Nina Ananiashvili and the State Ballet of Georgia, 8 p.m. Feb. 14-16, 3 p.m. Feb. 17, $34-$90, Zellerbach Hall, College and Bancroft, Berkeley, 510-642-9988, http://www.calperfs.berkeley.edu. TWO MORE ON TAP: For pure hilarity, nobody can compete this month with ODC's plan to go toe-to-toe with Cal Athletics on Lincoln's birthday in a rousing benefit to support both organizations. And for sensuous pleasure, Nacho Duato's Compania Nacional de Danza of Spain at Yerba Buena Center for the Arts Feb. 20-24 is the place to go. Co-choreographer with Jiri Kylian for 10 years at the top-flight Nederlands Dans Theater, Duato returned to Spain in 1990 to take over the 11-year-old company and lead it into the forefront of modernist ballet. Duato's style is at once luxuriously silken and earthy, pristine and clear. It's an irresistible combination. Details: Toe-to-Toe: Cal vs. ODC, 6:30 p.m. Feb. 12, the Concourse, 635 Eighth St., S.F., $125, 415-255-0333, http://www.odcdance.org/toetotoe. Nacho Duato and the Compania Nacional de Danza of Spain, 8 p.m. Feb. 20-23, 2 p.m. Feb. 24, Yerba Buena Center for the Arts, 700 Howard St. at Third, S.F., $35-$55, 415-392-2545, http://www.performances.org. BLACK CHOREOGRAPHERS: Meanwhile, in Oakland, the Black Choreographers Festival gets under way at Laney College on Feb. 8 with a lineup that includes Robert Moses' Kin, Dimensions Dance Theater and Paco Gomes, then takes the show to Project Artaud Theater in San Francisco. Robert Moses heads north to Kanbar Hall on California Street, opening Valentine's Day for a two-weekend run of all new work, his first evening of premieres in several years. Moses, who was recently named artist-in-residence and director of the Committee on Black Performing Arts at Stanford University, premieres "Rose," which has nothing to do with valentine bouquets and everything to do with the first dance director he worked with, Dottie. "Hopefully, there's some joy to it," Moses said by phone last week, explaining that Dottie was one of those artists who sees potential and good in the people around her. "It's a bit romantic, a little bit funny," he added, "a nod both to her and that moment. She literally wore rose-colored glasses," the choreographer said with a laugh. "But she taught us that 'Hey, the world's not so bad.'" Robert Moses' Kin, 8 p.m. Feb. 14-16 and 20-23, 2 p.m. 8 p.m. Feb. 17 and 24, Kanbar Hall, 3200 California St., S.F., 415-292-1233, http://www.robertmoseskin.org. Ann Murphy's In Step appears monthly in TimeOut Weekend.